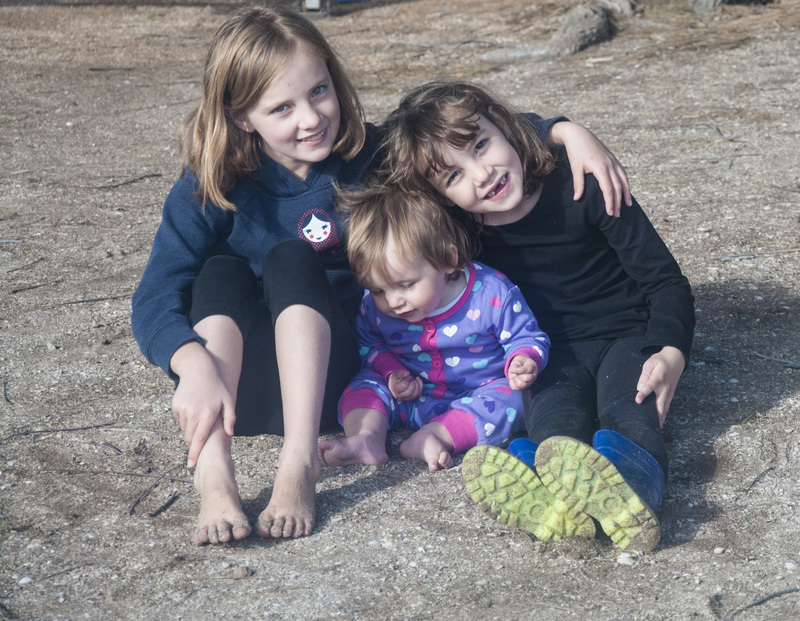 The girls were happy to just sit in the sun on the first day and play in the sandpit and on the playground. The following day was again rainy and windy and basically just freezing. We went into town though, and took the girls to the visitor centre, and another playground.. Did some groceries and did a little sight seeing. 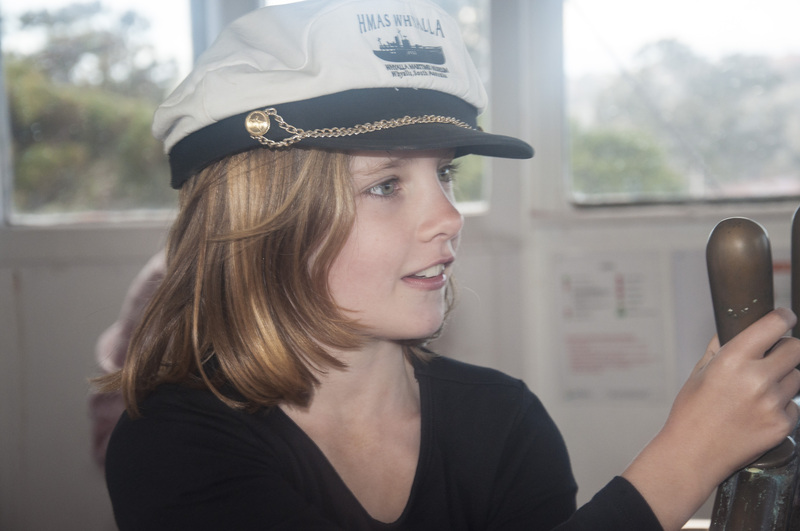 The following day our window was repaired and we said goodbye to Port Lincoln. A very short visit ! 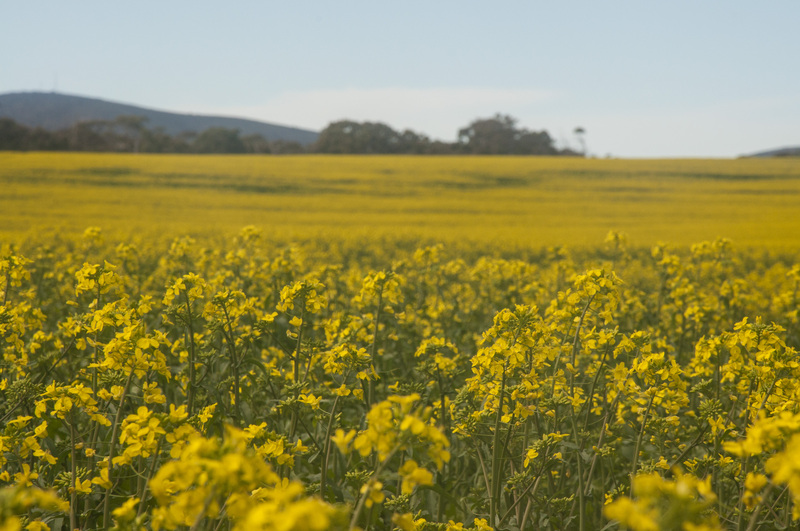 Canola Field on the way to Port Lincoln. Beautiful drive.. 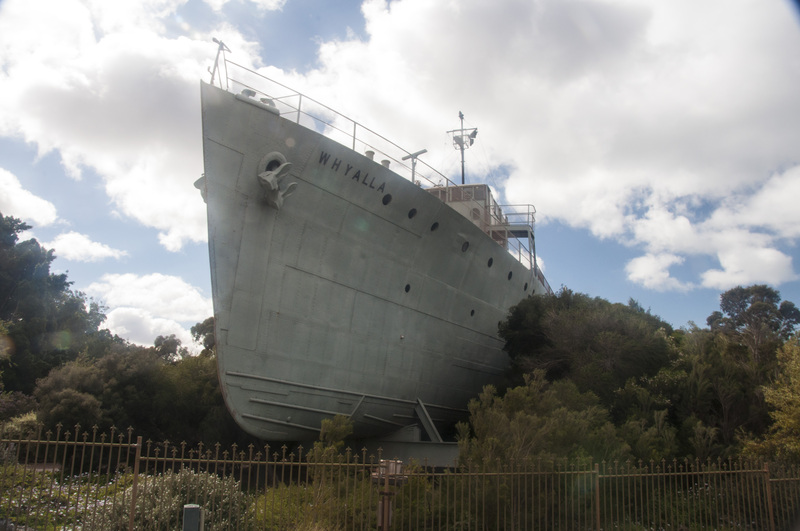 I was looking forward to going to Whyalla because it’s a huge town and I thought that there may be some ‘excitement’ about the place. Once again, we picked the wrong time to come. It was not only cold, but a little miserable. The caravan park we stayed in was filled with Miners (nothing wrong with that) but the place was a little ‘ferrel’ and very noisy. 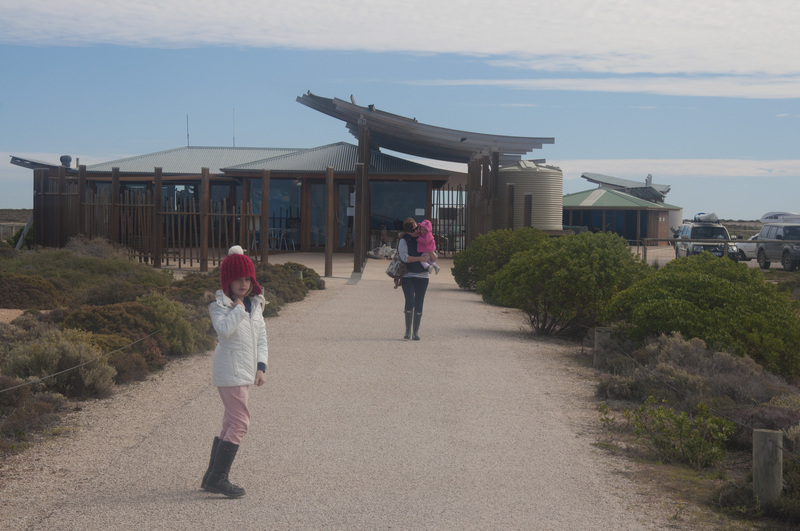 We had decided in Port Lincoln that as much as the Eyre Peninsula is pretty incredible, we wanted to escape the cold and get into the warmer weather ASAP, so again it was a very quick stop. We arrived in Whyalla quite late in the afternoon and once we set up we realised that a couple of our wine glasses broke. Not due to the speed or the shaking of the van either, the cupboard wasn’t shut properly (uh-oh) .. 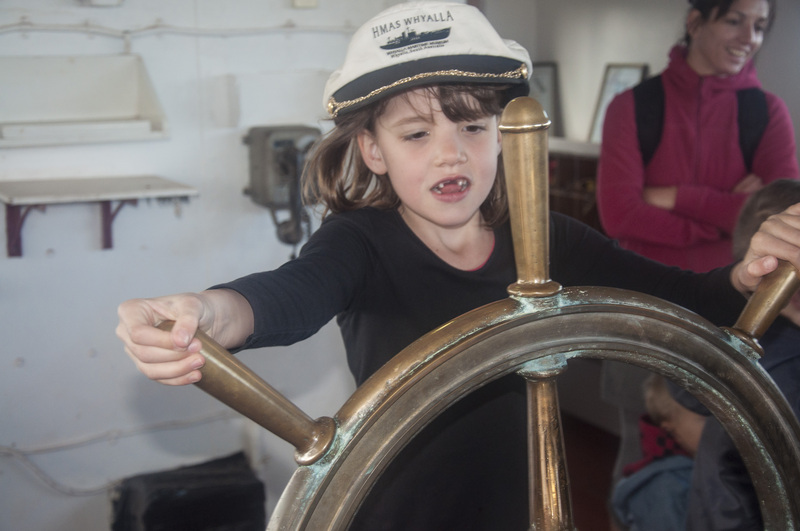 It took ages to clean up, little shards of broken glass were everywhere.. we made a quick dinner, quick shower and in bed for a bright and early start the following day.. We took the girls to the Maritime Museum on the way out of Whyalla though, so we did 1 tourist attraction ! As soon as we drove into this town, something didn’t feel quite right and both Wayne and I thought the same. We had no choice but to stay here though as it was the closest town to Coober Pedy and we’d been driving alot. The town has 180 people living there, although we didn’t see more than 3 people. Lots of houses, no cars though and it just felt weird. The caravan park looked really dodgy, with a few rundown apartments etc.. but the owners were nice and friendly. Very cheap and the toilets were clean although I used my own shower as we had water (YAY).. Woomera was a secretive military base, secretive in that you weren’t allowed into Woomera unless you had a reason. There is still is a military presence there though and as it’s in the middle of nowhere with lots of desert around, makes for a perfect space for blowing things up (training of course) and pre-deployment training for Afghanistan. They also test rockets launches and the likes. There is a public display of rockets/planes etc.. but not much else. . Not sure what else to say, it was a little eerie..
Where to begin? I’m sitting here now in CP, on our last night. 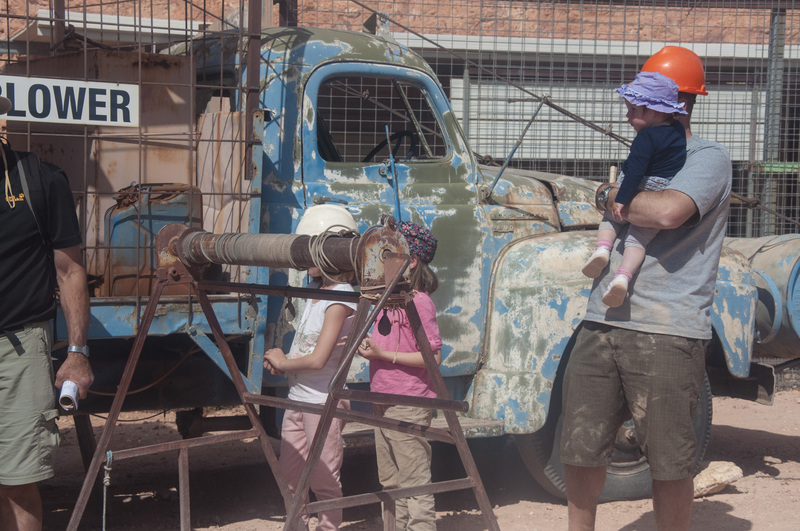 The girls are all asleep as they’ve not stopped playing in the playground and it’s been in Coober Pedy that they’ve finally overcome their shyness and have made a million little friends. Frankie has taken her first steps, Wayne has once again made friends with every single Grey Nomad in this place and now knows everything there is to know about caravans, toe hitches, brakes etc etc etc. The caravan park where we are staying is the first one you come to on Stuart Highway, about 2kms from the town. We chose this one mainly because it has a ‘pizza bar’ attached to the park which is also managed and owned by the same people (Greek couple who moved to Melbourne from Greece, opened up a few pizza bars in Melbourne and then decided to try their hand at ‘opal mining’ so moved here and basically stayed). This is the first place we’ve stayed more than 1 night where we have had NO WATER. And by that I mean, only our own tanks. 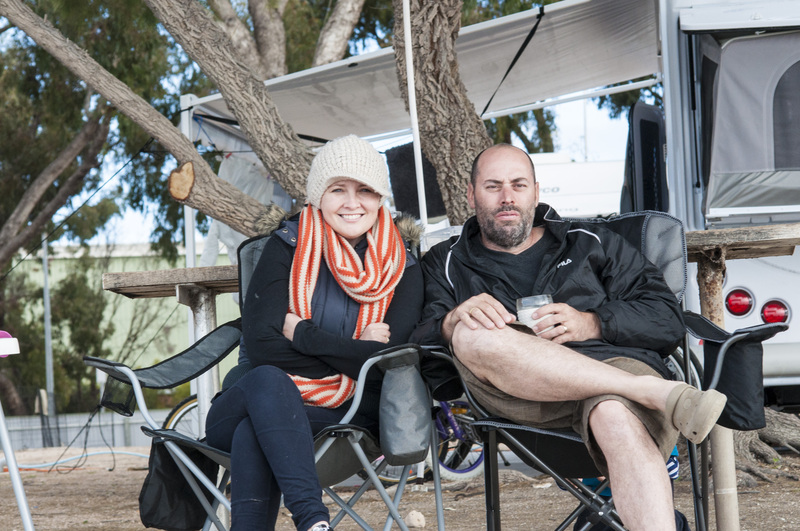 You have to pay for the shower (cheap – 20c per 2 minutes) and they charge a ‘staggering'(Waynes word) $6 a load for washing (We’ve done 5 loads).. It’s very red and dusty…So that’s the caravan park. 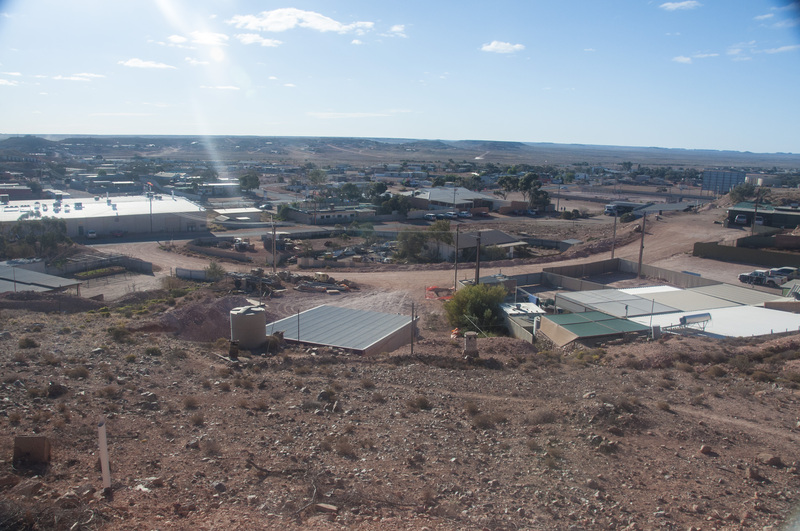 Coober Pedy itself is strange, in my opinion. 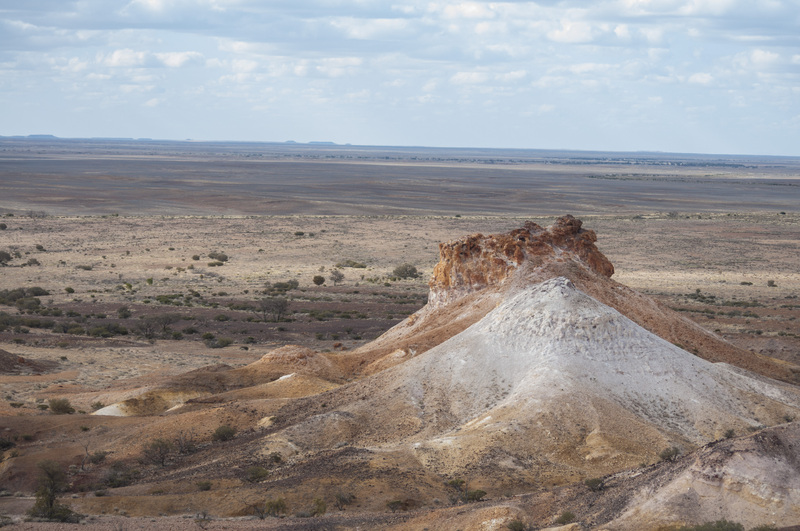 We’d been told by other people we’ve met along the way that Coober Pedy is a ‘rest stop’ at best and that we should just ‘keep driving’. I don’t agree with that, although I wouldn’t say I’ve enjoyed myself here either. The town is full of burnt out cars, abandoned homes, rubbish on the side of the roads. No one is strolling down the streets taking in the atmosphere. The underground houses that are amazing are UNDERGROUND so you can’t see them.. We did do a tour called the ‘old timers mine’ and that was very interesting. 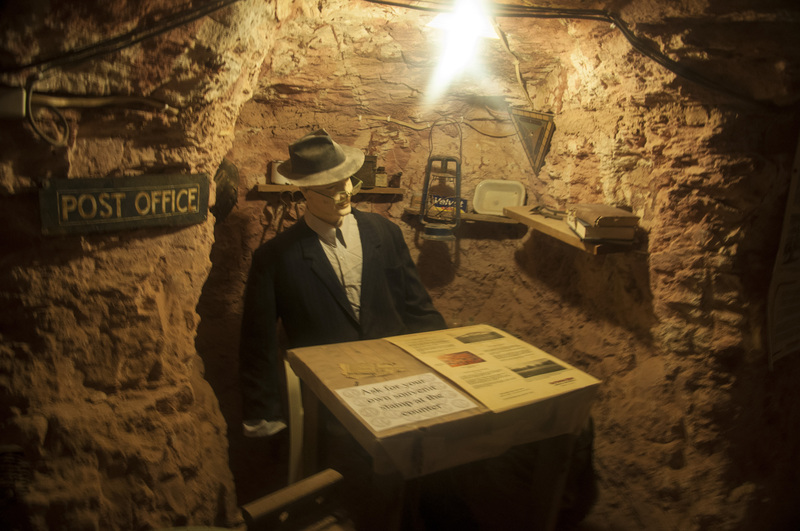 Hard to imagine how the men worked these mines and the conditions they had to work with, the OPAL is unique in that Australia has 85% of the worlds opals and Coober Pedy is the place to be if you want to get your hands on some. 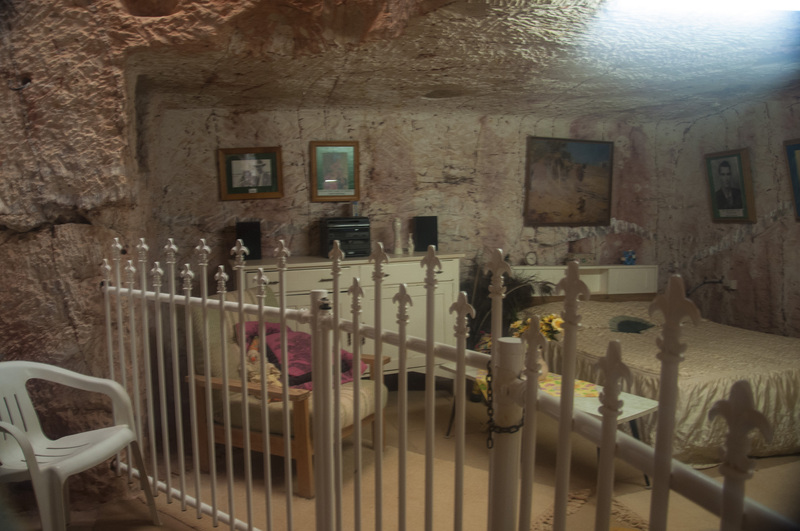 We also saw how a family in the 60’s lived underground, and they had everything we have now. Bedrooms, kitchens, bathrooms.. again, very hard to imagine firstly building it, and then living in it. The girls were very impressed with the tour (probably because they got to wear a hard hat). We also drove out to the Breakaways (pictures to follow) in a word BREATHTAKING and Wayne could have stayed there for hours if he didn’t have Sarah in his ear saying ‘Daddy, are you serious? We drove all this way to see just a ROCK’? 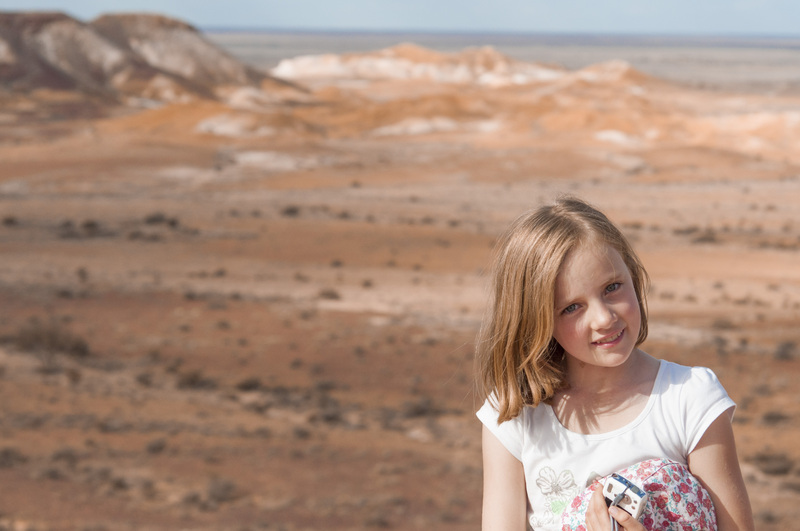 (and she is the child who is the most keen to see Uluru, hope she isn’t disappointed). I’m glad we came though, it’s a place we wanted to see and I won’t forget it. I also won’t forget the pizza we had, which was possibly the best one we’ve ever eaten 🙂 … we stayed 3 nights mainly due to the fact that the weather was lovely, and we were able to wash all our linen and do a bit of cleaning. For some strange reason I thought the housework would stop ! Off to Marla tomorrow making our way slowly but surely to ULURU. ‘Blower’ machine at the ‘Old Timers Mine’. 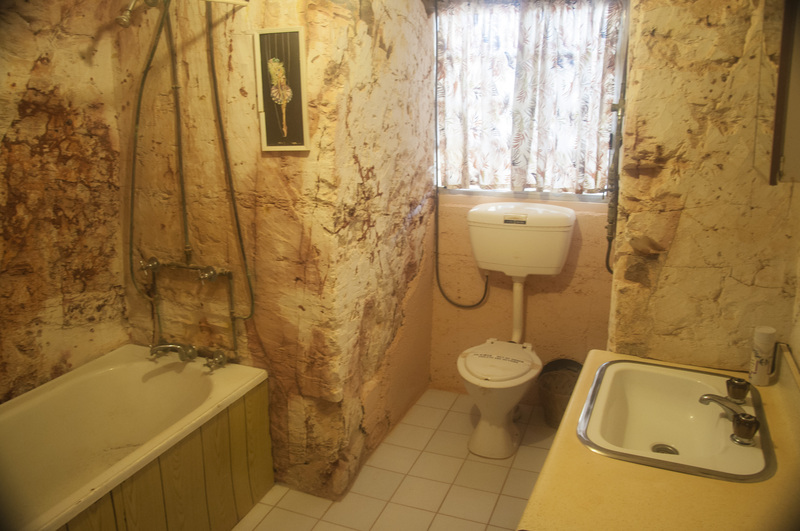 1960’s underground bathroom, belonging to a Mr and Mrs Gough and their 2 daughters. The LOVE NEST .. or parents retreat ! The first underground post office. Sarah loved this. The Castle or Salt n Pepper (Aboriginals refer to them as ‘two sleeping dogs’. 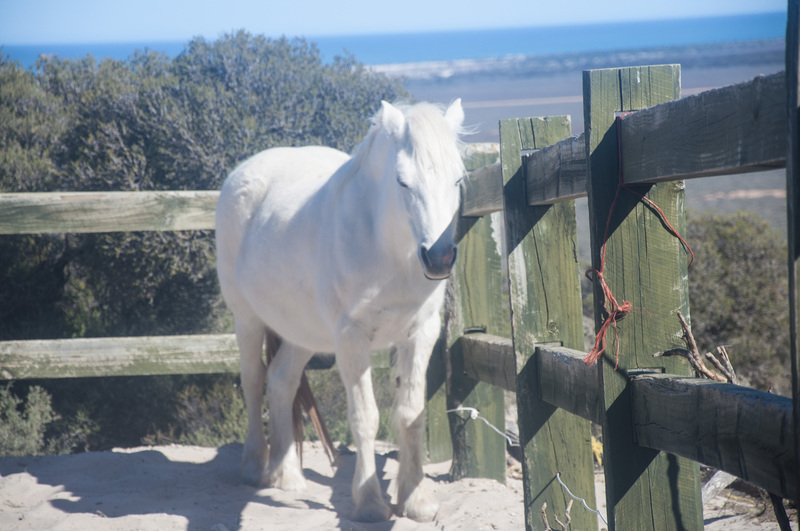 Wayne has taken some amazing pictures of the Breakaways, but unfortunately they aren’t uploaded as yet ! Next time..
We’ve had a great week and it’s so nice to be out of the cold and rain ! The Morrells who are travelling ! (shake it up a bit). 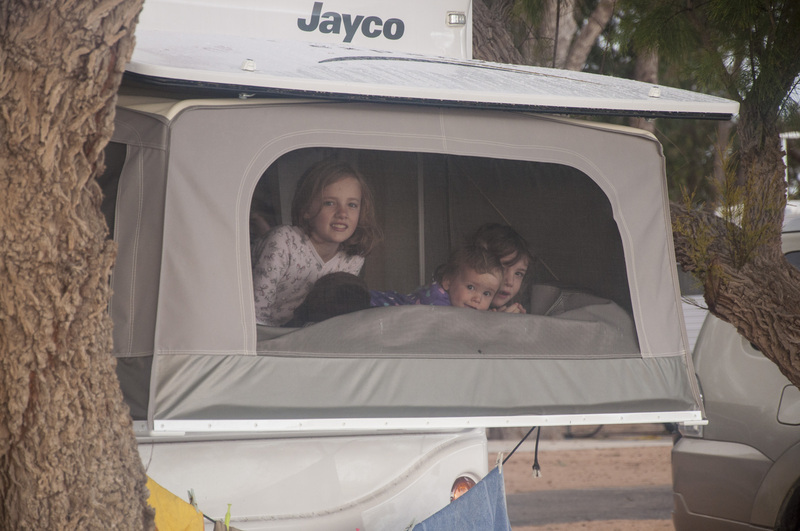 We’ve been here almost a week and tomorrow will be our last night (Sunday) before we head off to Port Lincoln to collect our replacement window for the caravan. A slight detour which means we miss out on Whyalla and a few other towns along the Peninsula but we’ve decided to just head North anyway and get out of this wet, wild and windy weather. 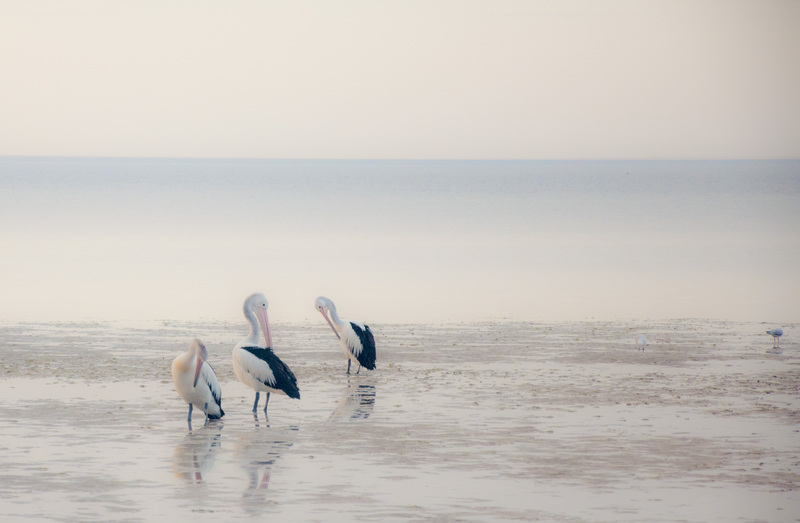 Streaky Bay I’ve decided would be fabulous in Summer.. and even Spring.. however Winter …..We’ve had better ideas ! Although that’s not to say it’s been all bad. Wayne and the girls have fished (still waiting on that monster fish) We’ve all been for a couple of family bike rides, we played lots of board games, watched all 3 of the “Back to the Future”movies and Frankie has basically fallen in love with all kinds of dirt, gravel and sand ! I’d love to come back there when the weather is warmer. We’ve picked a very wet n’wild week and everyone here is either leaving because it’s too cold, or pulling in and then leaving the next day or so for the same reason. I’ve tried to just ‘go with the flow’ this week, however I’ve failed miserably. There has been a few tears, some laughs and lots of cups of tea and red wine. Olivia has been fishing alot and generally getting down and dirty with her Daddy. Frankie is loving having her Daddy around and she just plods and plays with dirt.. she’s sleeping so well too (finally) taking us about 5 mins to put her to bed around 7pm each night, I’d say she is just knackered after her little adventures. Sarah is more like me and likes to SWEEP and make sure that things are in order, and then she’ll go about her day and the big news about Sarah is that she can now ride her bike 100% without training wheels, she can hop on and off all by herself and we’re very proud of her. 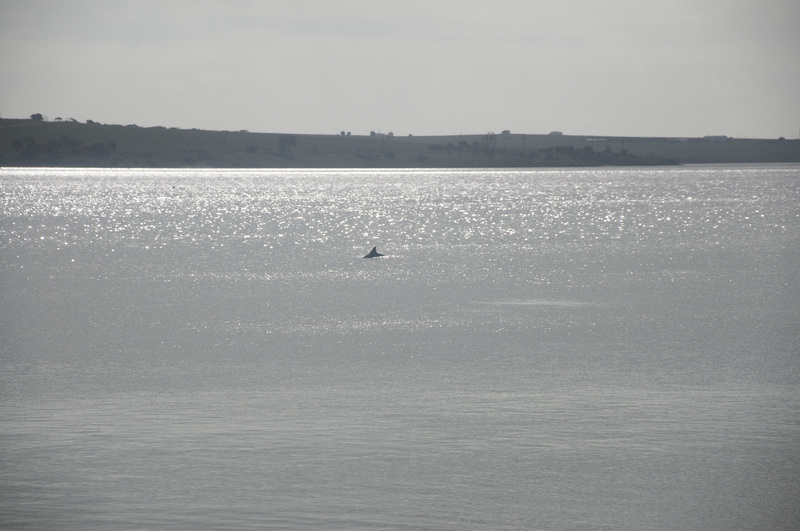 Here are some pic’s of the beautiful streaky bay ! 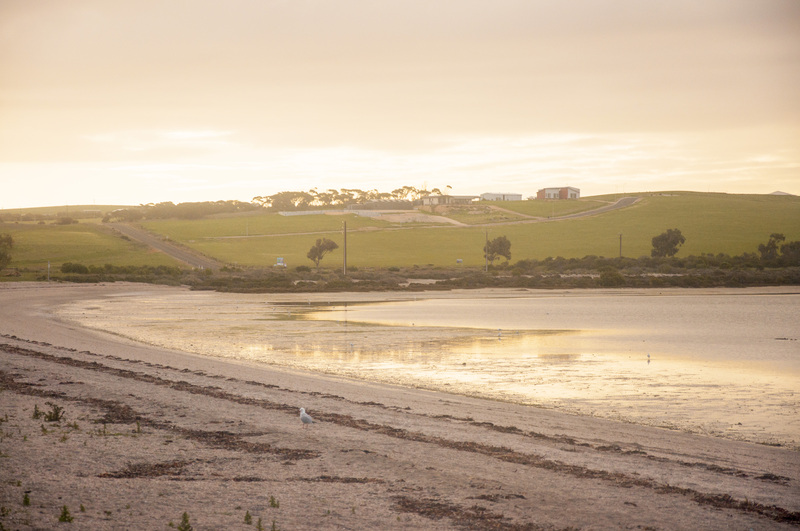 A very short snapshot of our week..
Beautiful Streaky Bay … view from the caravan park. Every morning and every evening.. right outside our caravan. Frankie loves them ! F L I P P E R …. come back ! Wayne said ‘smile Jo’ so I did.. and he didn’t !! not the best ‘happy couple’ shot.. Snapshot of our 2nd week into our adventure (really our first week on the road). 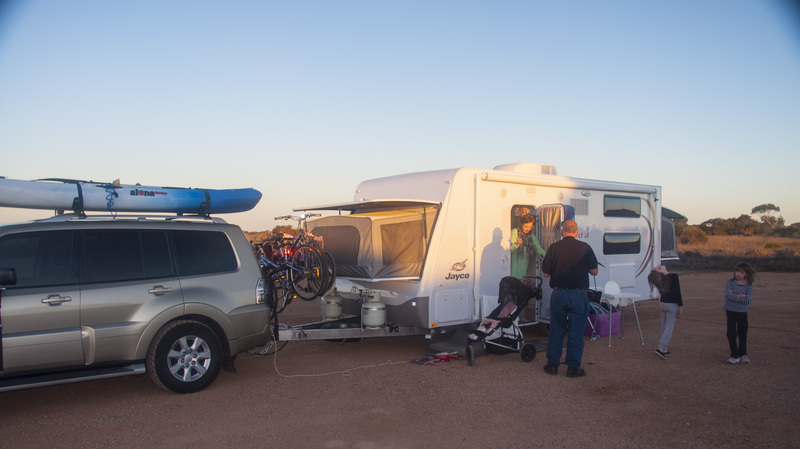 Quinns Beach caravan park – Merriden and Kalgoorlie. We wanted to leave Quinns really early and take off, but seeing how we’d stayed there a week we got to know pretty much everyone there, and they all wanted to come up and wish us well. It was after 11.30am before we were able to take off and start our travels. Once we were on our way though, we all felt pretty excited, nervous and were hoping that Frankie would behave in the car. We made it Kal just after lunchtime the following day and checked in at the Discovery Caravan park. I’m not sure what I expected in a 4 star park, but I was disappointed (to begin with anyway). It was all gravel and dirt, not 1 tree and hardly any grass. I think I’ve been spoilt in the past maybe, but I tried not to ‘whinge or complain’. We had our brand new van and who cares if the toilet block is one of those make shift ones (the other ones were being repaired). 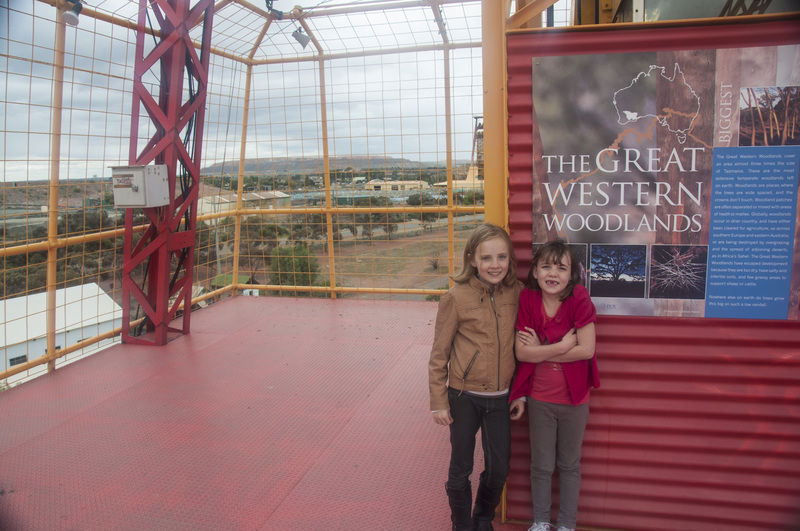 As it turns out our stay in Kalgoorlie was fun, we stayed 3 nights and the girls had a ball. We mainly did tourist things, like visit the SUPERPIT which the girls were in awe over. 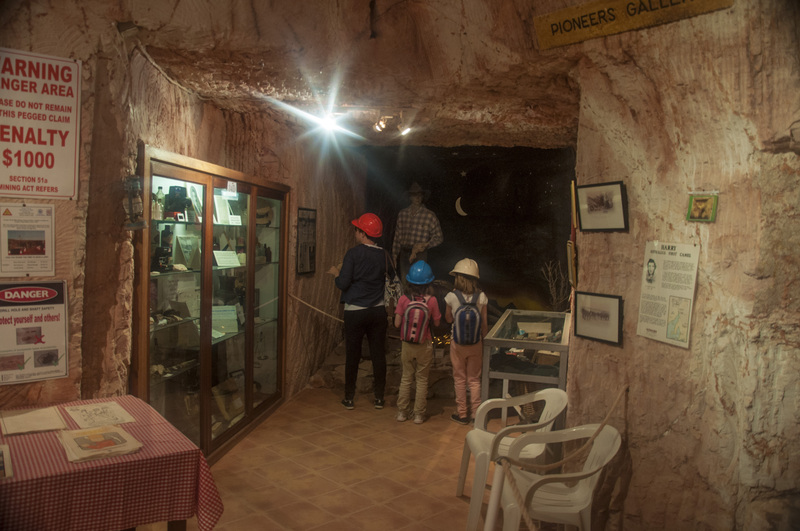 They also really enjoyed the Museum and finding out all about the gold and the mining. They were amazed at how the people lived in the early 1900’s and the little conversations they were having with each other was very cute..We also took them to the RFDS and they got to see and go into one of the planes. 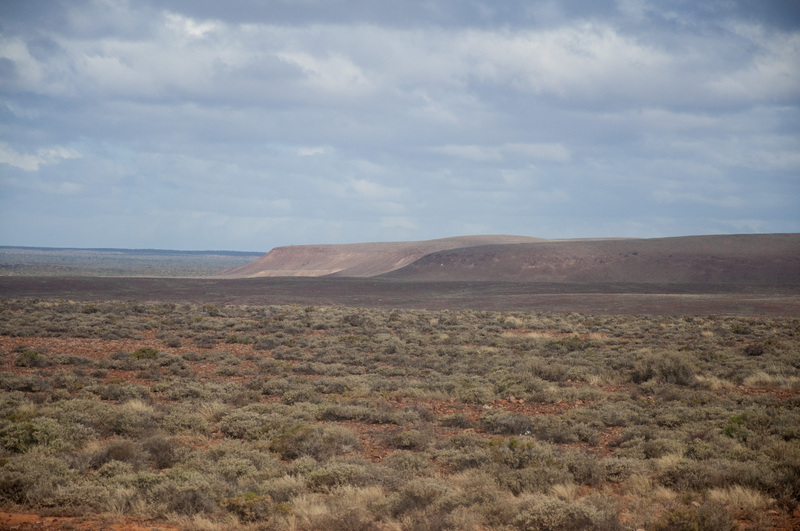 It would be very scary (for me) to live in such isolation and the RFDS do such an amazing job that I’ll donate to them every chance I get. . (pictures of Kalgoorlie). Viewing platform at the Museum in Kalgoorlie. 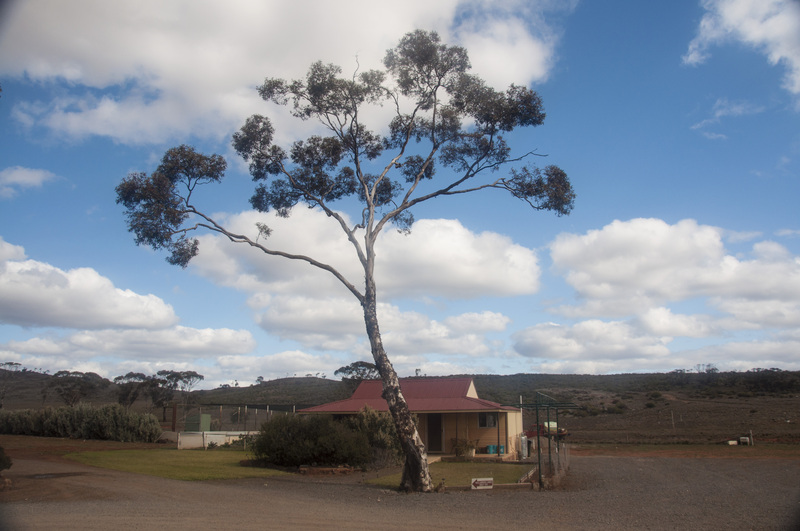 After the loveliness of Fraser Range Station I just assumed that all places along the Nullarbor would be as inviting and beautiful. I was wrong – plain and simple. After a few hours of driving we decided to stop, again just for 1 night and we chose Cocklebiddy for one reason only. There was NO WHERE ELSE. $25 a night with power (no water so went without a shower – I just couldn’t bring myself to use the ones they had available, not when I’ve been showering in my lovely hot watered shower in the van). I’m not sure how they get away with calling this place a ‘caravan park’ but it was.. I guess… Just a space, filled with gravel and a power pole. Can’t complain though, was a place to stop so we could make dinner and jump into bed (after a couple of glasses of wine) was very cold and very loud. Glamping ? I think NOT..(that’s our friend Kevin coming over for ‘happy hour’. 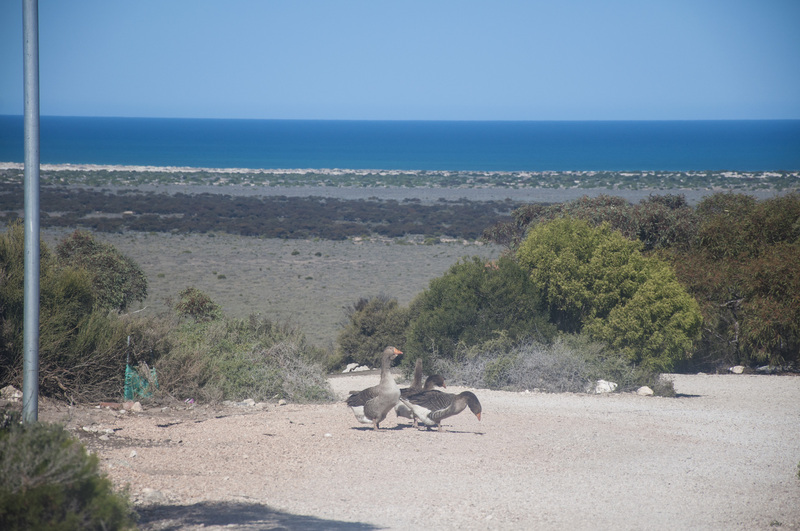 Hello Eucla.. where the desert meets the sea.. something like that. 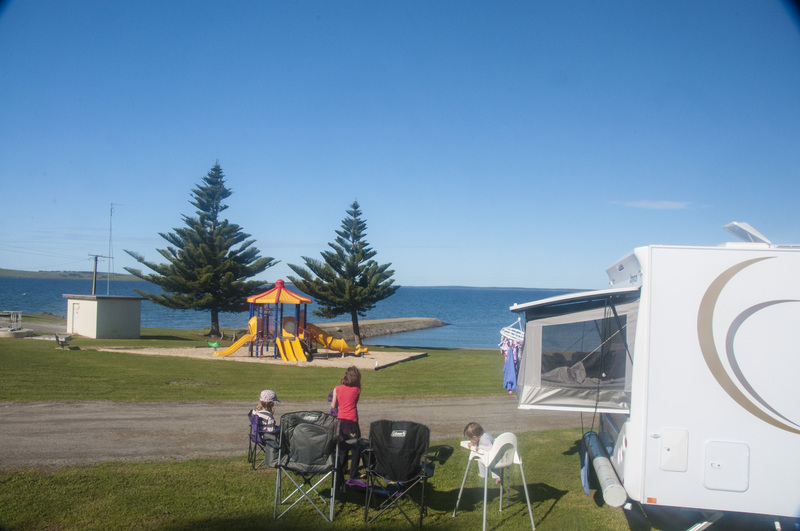 We arrived at our next stop along the Nullar just after lunchtime again and this time we had a dirt gravel space reserved for caravans (with power but again no water) but this time we had an ocean view. It was amazing and again, so very unexpected ! We also could walk 2 mins and get a decent coffee and the kids had a little playground. I even managed to wash and dry a load of washing. Again though, it was only for 1 night.. (and I did have a shower) ! 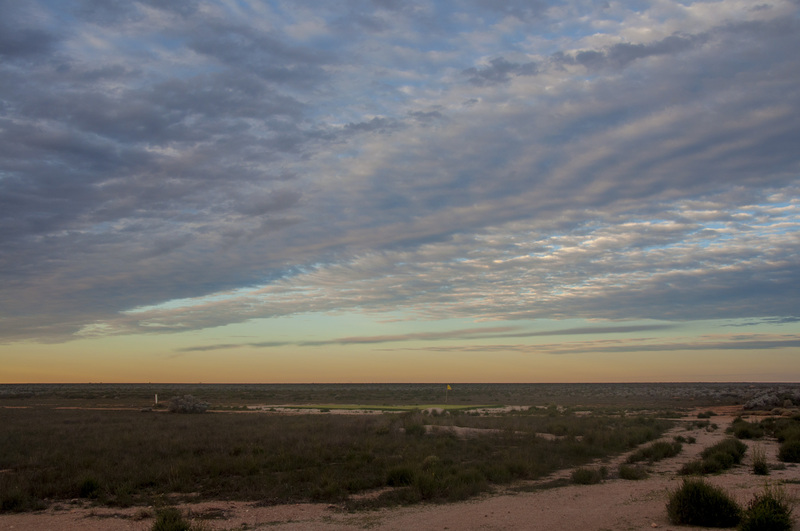 A few things happened along the way to our last stop along the Nullarbor. 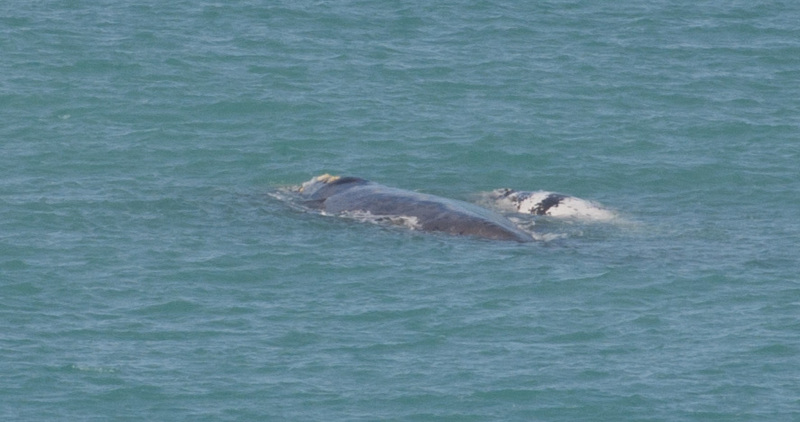 Firstly, our caravan dining room window blew off (without us knowing until we stopped hours later) and we saw the most beautiful whales and their calves at the ‘head of bight’ and the most breathtaking scenery. 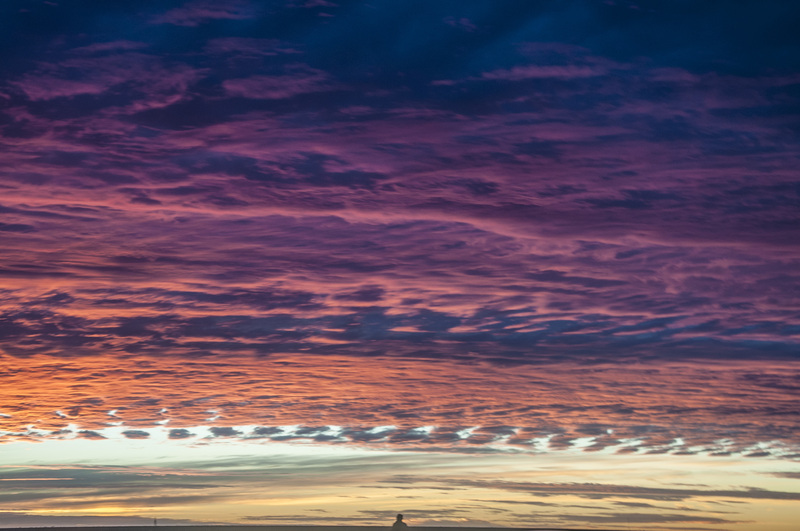 The Nullarbor Hotel/Motel was not dissimilar to Cocklebiddy in appearance but we were given an amazing sunset and as I said before, the whales were beyond words. We were lucky to be travelling between the months of June – October, otherwise we wouldn’t have seen them. I’d like to mention that at this point in our trip we said goodbye to a lovely couple who we have become friends with. Margaret and Kevin who are in their early 70’s are travelling around for 3 months and are missing their kids and granddkids like MAD. We met them in Kalgoorlie and we just happened to be travelling across the Nullar at the same time. Everynight we had ‘happy hour’ and we shared the cooking etc. They doted on our girls and constantly told Wayne and I that we had a beautiful family and that I was a wonderful mother and Wayne was a good man. She often came over to the van to say that she heard us laughing and that it was a beautiful thing to hear etc.. I just loved her.. (not just because she told me I was lovely either) !! It’s nice to hear from someone who has ‘been there, done that’ and is still supportive and understands how parenting can be hard as well as rewarding.Olivia and Sarah (and Frankie) were spoilt rotten with hugs and lollies and this morning when we woke up and had to say good-bye they were a little sad. Anyway, they were both so amazing and we will be catching up with them (and their grandchildren I hope) in Canberra on our travels. Walking to the Bight to (hopefully) see some Whales..
It’s Saturday night, around 10.30pm and I’m exhausted in a way that I haven’t been before. Emotionally, physically and of course Frankie-ally too. We’ve lived in our Van for exactly 1 week and tomorrow we set off and leave the metro area. Are we ready ? Well.. I did say to Wayno ‘let’s just stay another night’ but his response was ‘Jo, we have to just leave and begin our trip’. I know this, but even so I am still nervous. We’ve had a hard time with Frankie this past month,with her ear infection that just won’t go away. Finally she seems to be on antibiotics that are working with her and not against and the Dr gave us the all clear to go away last night. This made Wayne go into ‘packing mode’ and we are pretty much ready to leave early in the morning. Just have to pack up a few things, pile in the car, hitch the van up and take off. Sounds easy, but we shall see. It’s great. It’s big enough, sleeps everyone and the toilet and shower are a godsend. We’re very domesticated and have been cooking dinners every night. Washing up has been nice and quick as I only have 5 of everything.. and we are getting used to the ‘coziness’ of being together, all in one space, all at the same time, all in the same space (did I mention that already?). Over this past week we’ve had loads of visitors, friends and family and I’m still in the head space of ‘kids, take your shoes off before entering our van, no jumping on beds, in fact NO sitting on beds.. go outside and play , it’s only rain’.. although I’ve been assured that this will change and over time I’ll become less precious. I still hate the thought of sleeping in a bed that has sand and dirt in it. Sadly (and I say sadly because it can become a bit tiresome) Sarah is a little like me. When I make my bed, I like it to be even and straight and tight and all matchy matchy. I do realise that in this van with the end beds being canvas etc, they are harder to make and won’t be straight. However little Sarah doesn’t understand and every morning when she goes to make her bed, she almost ends up in tears.. More than once I’ve heard Wayne say ‘you’re like your mum’ and I don’t think he means that as a compliment somehow ! Wayne has been modifying this car so much, we have everything you can think of and then some. Today our friend came over and helped Wayne attach fishing rod holders to the car. We’ve had a two-way radio connected up, a reversing camera, duel fuel tank.. you name it, I feel like we have it. 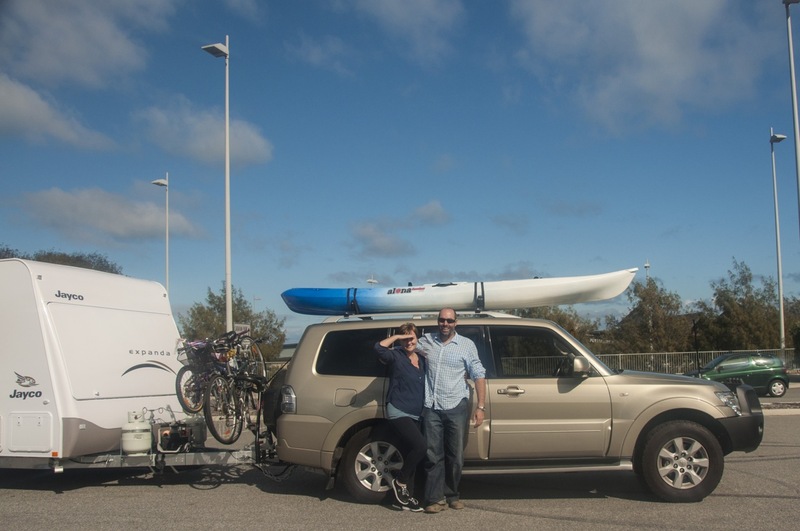 For the past 3 weeks I’ve been driving around Perth with a 2 man kayak mounted to the roof racks. I feel like a fraud for the most part. We’d better catch some fish baby.. Packing up the house turned out to be not as emotional as I thought. The packing itself was hard going, and tiring but it was always going to be. We handed over the keys on the 20th July and haven’t looked back. 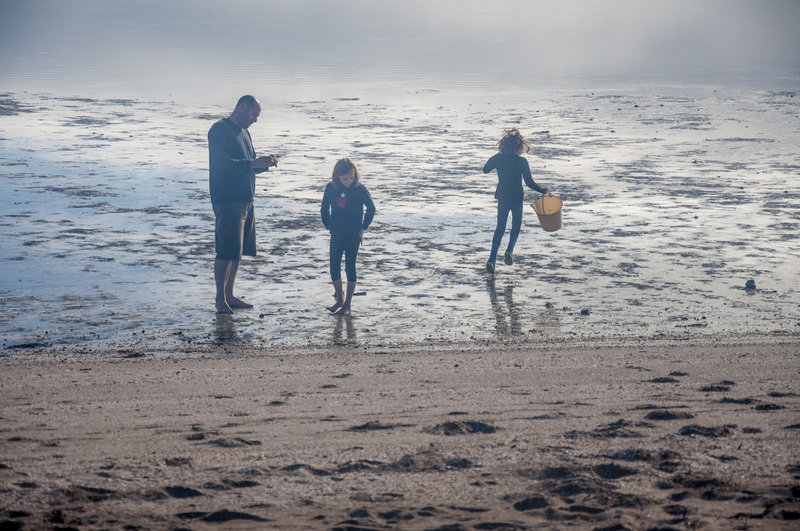 I thought I would be attached to that home as we built it and loved it so much, but turns out that a house is really just a house, as long as we have the kids and each other – nothing else matters. I’ve gone short. Super short and love it. Feel liberated and like a new woman. Glad I had the guts to just chop it off . Sarah hates it and told me as much. Thanks for that..
You know you want them.. just buy them and be done with it. Thanks for this weekend, coming up and saying goodbye, and also a huge thankyou to those special people who helped out Wayne and I when we needed it the most.. We love you all. There has been tears, tantrums, screaming… but also cuddles, kisses, laughing and moments of ‘WOW, we are really doing this’. I’ll post pictures once the rig is all set up, but for now this random blog post of mine shall end. I’m about to crawl in beside my beautiful little warm 13 month old baby girl and hopefully sleep well and dream of my own version of ‘fifty’.. (ha, that’s for you pinch – I know you’ve read the books). . Snapshot of our week !